The secret is well and truly out about Reuben Hills. I have certainly heard a fair amount of mumblings and plenty of recommendations that I review it so today was the day! The people you can see waiting above were only a small portion of those determined to brave the wait for RH’s delights. There were more seated on the girder just inside as well as out of shot! This place is F.U.N.K.Y. iPads instead of cash registers, head-bobbing Lupe Fiasco beats in the background, quaffs & lensless-glasses everywhere! 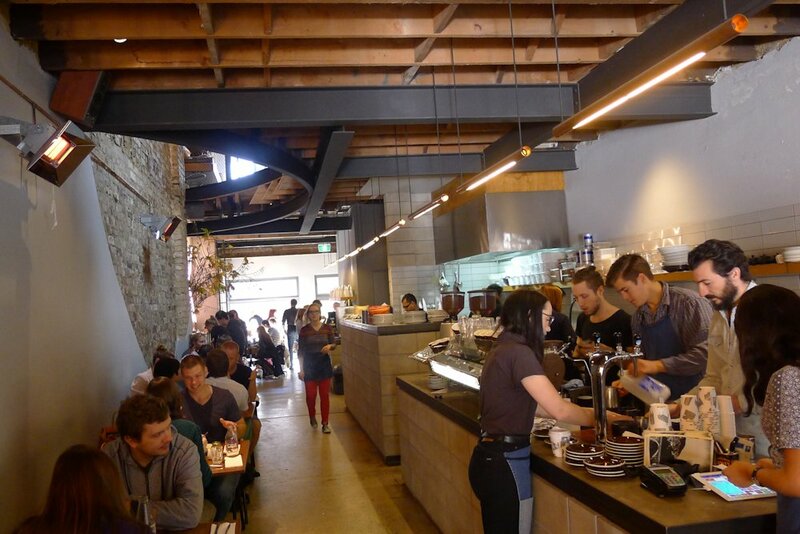 The interior is a mix of commercial and industrial with the warmth that plenty of heaters and the aroma of coffee roasting upstairs provides. They take their beans very seriously here and the staff appear to be a tight-knit, dedicated and fun group who maintain service professionalism at all times. 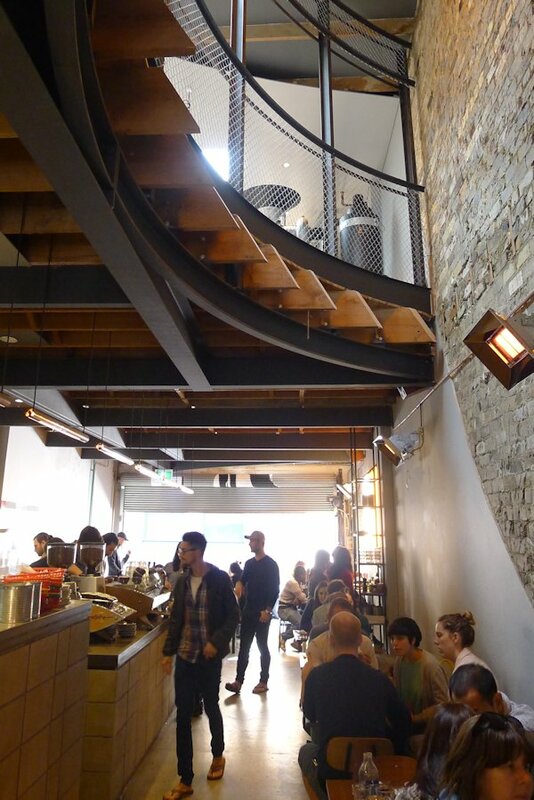 Despite this being one of the busiest cafés I have visited, it was also one of the most organised. 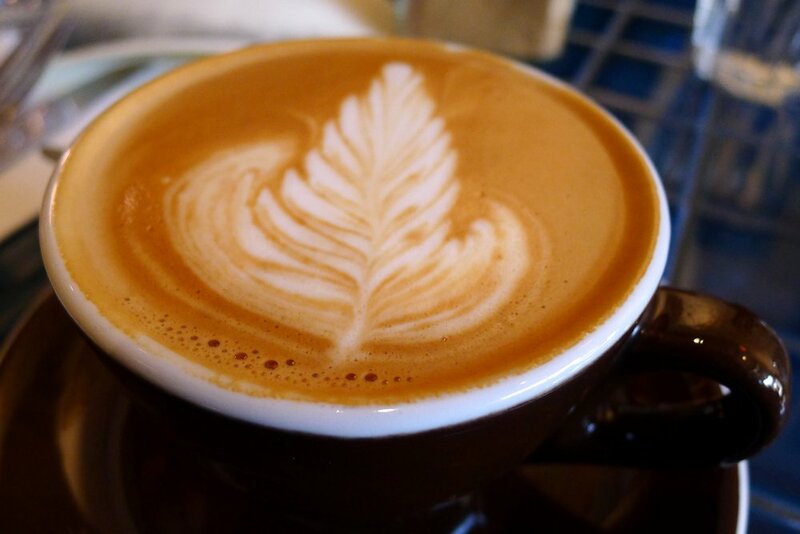 The current beans of choice go by the name of Rwanda Cup of Excellence 2011 #20 Ingoboka. 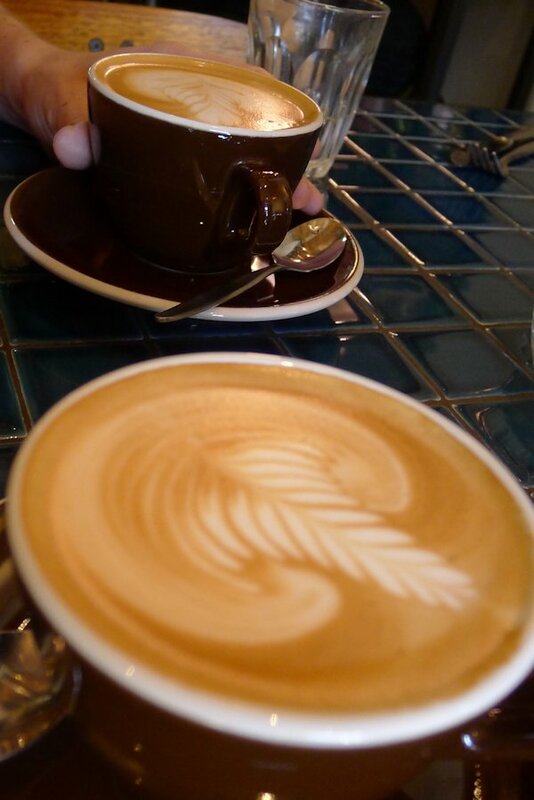 Deep in colour and intense flavour, our flat whites ($5) deserved a second round, so much were they enjoyed! I am always the first to sample something unique to an establishment we are reviewing. So how could I go passed the Mexican Ibarra choc chilli shake ($8)? 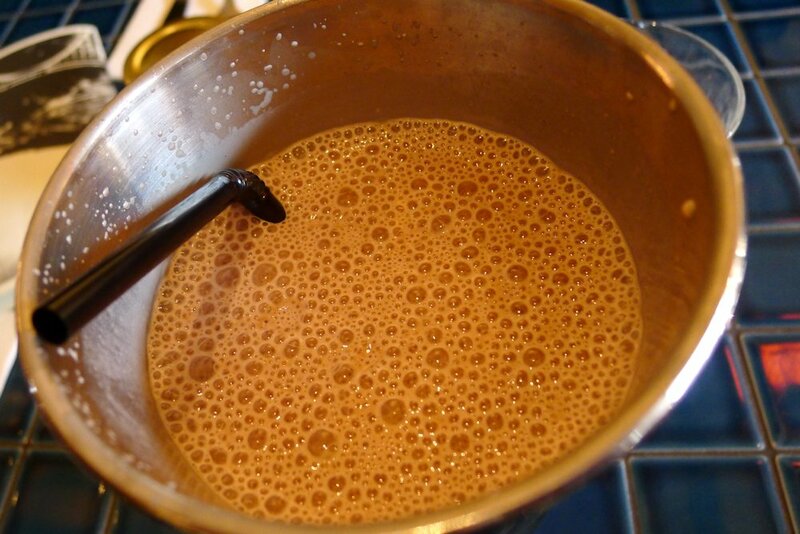 This milkshake delivers what it promises with a rich, smooth chocolatey flavour and one hell of a spicy after-effect. It’s not everyone’s cup of tea, but it woke me up and it was executed well with a good texture and lots of flavour. The green or assam ($3.50) teas are both grown in high altitude locations. This usually results in a richer flavour and tea that can be brewed multiple times, so infused are the flavours. 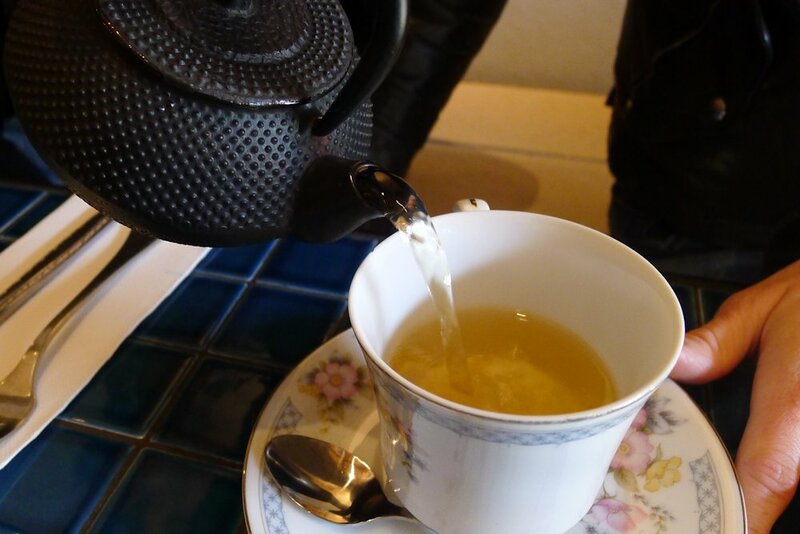 Our green tea displayed hints of aniseed as well which was unusual but refreshing. As with dishes we were to receive later, the unique and individual cups and saucers really add some uniqueness to the surroundings. Occasionally on our review exploits we have a bite of a dish that makes us say “Oh my God”. 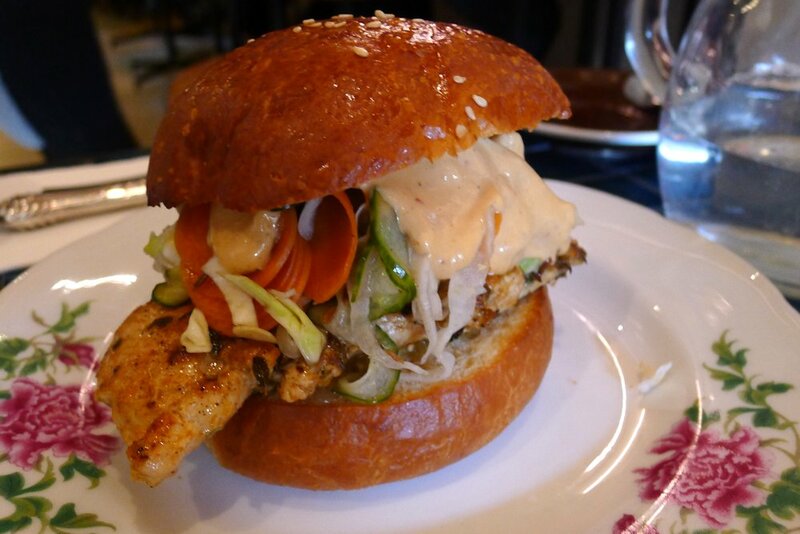 The spice grilled chicken fillet on brioche ($15) is one of those dishes. The sweet brioche itself was delicate and flavoursome, the chicken fillet has some kick and was extremely tender. But the rest of the ingredients – the slightly picked pickles, tomatillo salsa, carrot, cheese and abundant chipotle aioli blew us away. 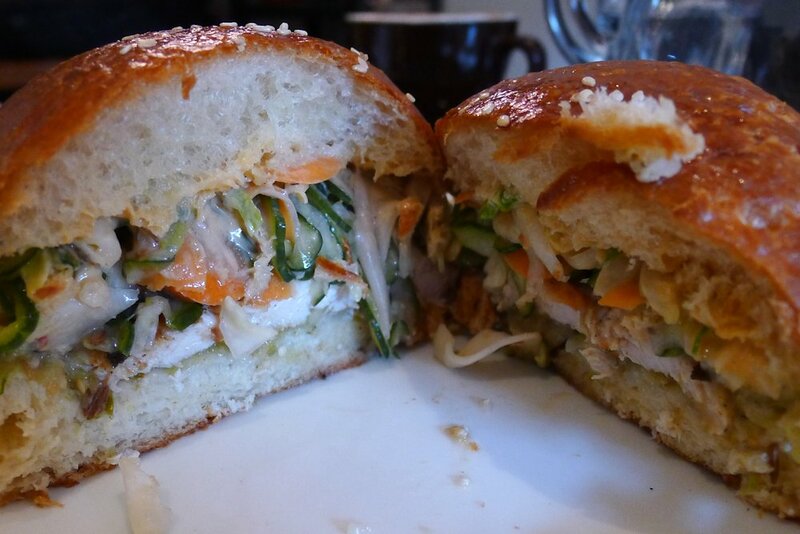 Crunchy, fresh, spicy, soft – this had it all and we will be having it again. We were getting very jealous watching the dishes that went by our table but were needn’t have worried. 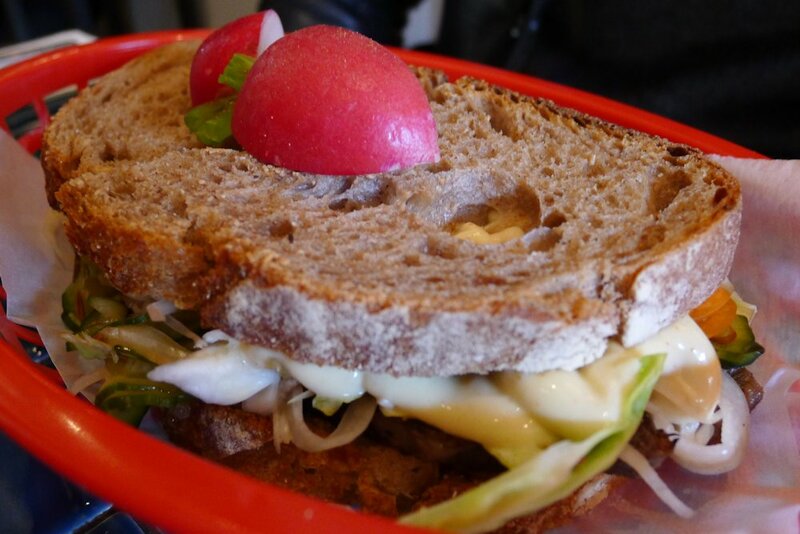 Everything that we ordered was about to knock our socks off including the NOT Reuben ($16). Served modestly in a plastic basket with wax paper, this is a sandwich to rival its New York alter ego. Start with Wagyu salt brisket and you already have a winner but top it with melted monchego, coleslaw and horseradish cream and my guest, Tom, couldn’t stop raving. Avocado on toast with some seasoning is simple but a favourite amongst most people. How could it be improved? 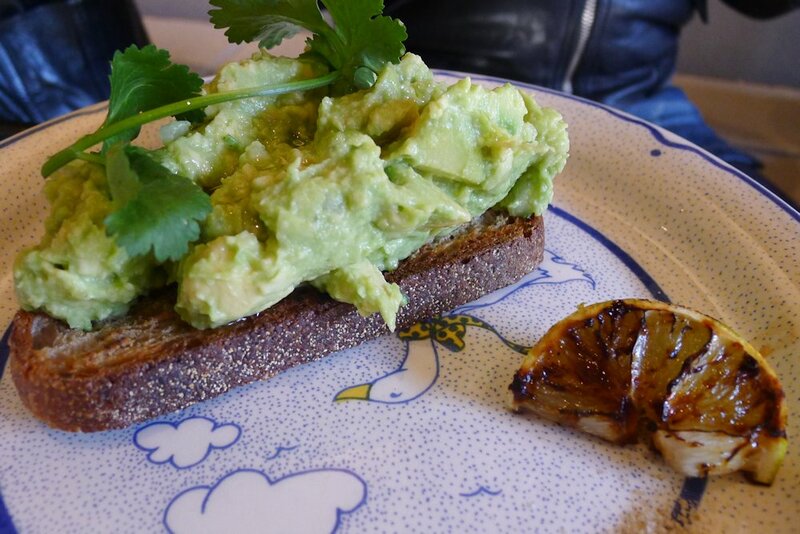 RH mixes their avocado with coriander and lime ($12) as well as cumin and white pepper and salt. This was a small and refreshing dish but is well worth trying. As with everything else, it’s obvious that it was prepared with care. Notice the uppercase “SOFT” on the menu. 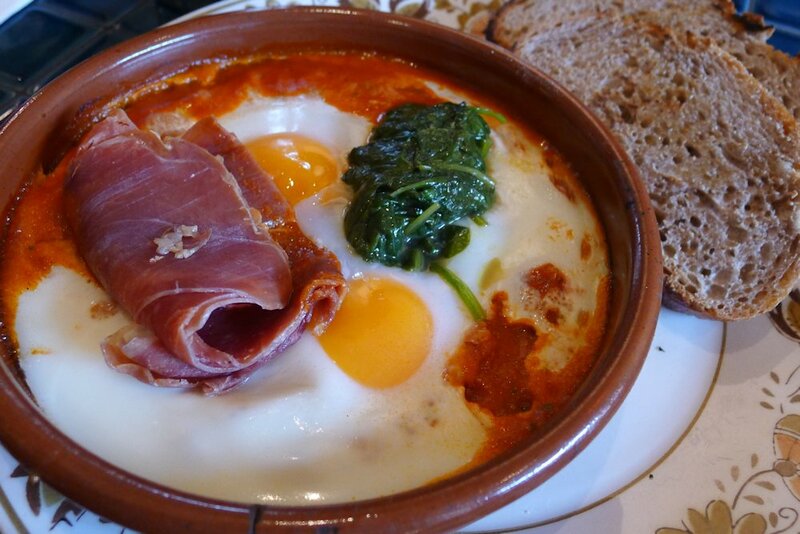 I suppose lots of people who ordered the baked eggs commented on the runnyness of theirs. Well the SOFT baked eggs ($16) come in two varieties. I had requested the goats curd, wilted spinach and ranchero sauce version but there was something lost in translation and I received mine with shaved jamon and the aforementioned wilted spinach and ranchero sauce. I was not about to complain because i. baked eggs is not a quick dish to prepare and I didn’t want to wait and ii. I enjoy all foods and am happy to sample it all in the name of SoS! It was a great combination. As with the milkshake and the chicken fillet brioche, this was another dish with a spicy kick. Despite the name, the eggs were still cooked enough and beginning to firm. Also very filling thanks to the rye sourdough on the side. It’s one of their most popular dishes. My one regret after our visit was that we did not try the Dogg’s breakfast ($9). This is an ice cream sandwich with salted caramel! I asked about it afterwards and it is in fact quite small. It will be a definite next time. Others that sounded fantastic? Columbian baked beef empanadas with pico de gallo ($10), trifle of muesli, berries in orange syrup with honey and orange blossom yoghurt (this was elegantly served in a spherical clear bowl to a neighbouring table and looked amazing, $12), Baleada (free range eggs, queso fresco, pulled pork and chimol, $13) and heirloom tomatoes, labna, rocket and confit garlic on rye ($14). For me, this is a café with the lot and there is enough on the menu to entice me back multiple times to sample more of their unique offerings. 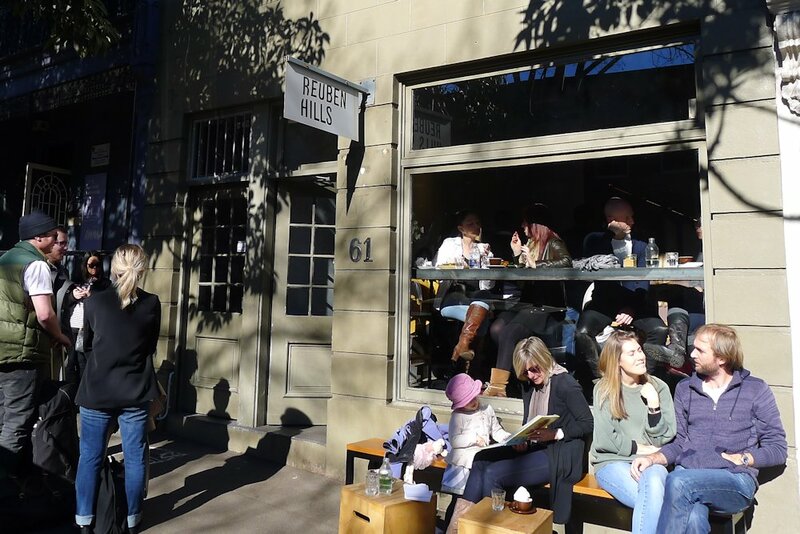 Reuben Hills is highly deserving of their recent positive press. This entry was posted in Sydney - CBD, Sydney - South and tagged Free range eggs, Organic Options, Parking close by, Reasonable prices. Bookmark the permalink.